The Passmore Centre, a new business skills and training hub designed to provide access for local people and businesses to high quality apprenticeships and other forms of employer-supported study, opened today (Wednesday 28 November). An event to mark the occasion, was held at the centre, hosted by London South Bank University (LSBU) and attended by councillors from Southwark Council, local employers and apprentices. The Passmore Centre will provide facilities for employer meetings, community engagement and teaching, while serving as a ‘one stop shop’ connecting businesses with potential apprentices from the local area. 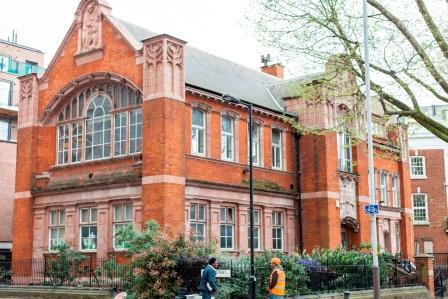 The refurbishment and transformation of the Victorian Passmore Edwards library into the new Passmore Centre has been made possible thanks to £5 million funding from Southwark Council. This significant investment has had the additional benefit of removing the attractive but disused Grade II listed Passmore Library building from Southwark Council’s Register of endangered buildings. Professor David Phoenix, Vice-Chancellor of LSBU said: “I am delighted that with Southwark Council’s support we are able to bring this historic building back into use as the new Passmore Centre for professional and technical education."